The story of the Underground Railroad in Lycoming County contains many heroic and courageous persons but none towers over the story so literally and figuratively, as does Daniel Hughes. Hughes was a man of towering stature, standing between six feet-seven inches and six-feet-10 inches, weighing approximately 300 pounds. 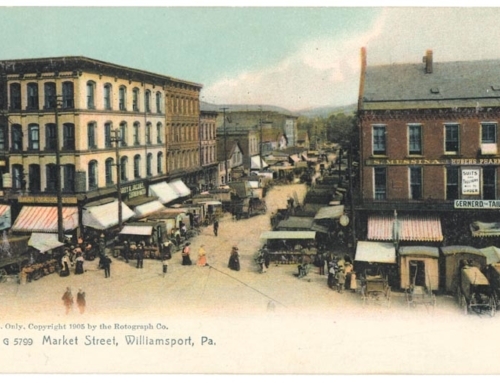 He moved to the Williamsport area in 1828 where he married an African-American woman, Ann Rotch. Hughes’ occupation as a lumber river raftsman operating on the Susquehanna River between Williamsport and the Havre de Grace, Maryland area was the means that enabled him to become involved in smuggling escaped slaves along the Underground Railroad to Williamsport. He then would hide the fugitive slaves at his house located in the vine covered, woods covered area northwest of Williamsport. It was a natural haven. The haven aspect was further reinforced by a series of caves that were located on and near the Hughes property that also further served as a place of refuge for the runaway slaves. It took great courage and resourcefulness to “conduct” these escaped slaves along the Underground Railroad. Hughes, his wife and 16 children exposed themselves to great risk in their quest to help the slaves “Follow the North Star to Freedom” or as an old Underground Railroad song stated, “Follow the Drinking Gourd.” It was against the law to assist runaway slaves, punishable by imprisonment and fines. Also, many people in the area were unsympathetic to the runaways’ plight and the Hughes and others who aided them were subject to harassment and possible physical violence or even death. Hughes would most often operate on moonless nights that greatly lessened the possibility of detection by the always-present slave catchers. The slave catchers became more of a hazard after the passage of the “Fugitive Slave Act of 1850,” that allowed slave catchers to operate in the northern states with no legal restrictions. To help thwart the slave catchers Hughes and his sons often would stretch horsehair from one side of trails to the other hoping to catch these bounties hunting slave catchers off guard as they traveled by horse. As the slave catchers came to these areas they would be knocked from their horses and either slowed down or deterred from continuing. Hughes and his son would conduct the runaways to the next station in Trout Run as they made their way north to Elmira and eventually into Canada where the runaways were not subject to the “Fugitive Slave Act.” The Hugheses contributed further to the African-American community by donating a portion of their land as a cemetery for African-Americans. Among those buried in the cemetery are nine African-American veterans of the Civil War. There is a Pennsylvania Historical Marker at the site of the cemetery, and Loyalsock Township has recently taken over maintenance. The story of Hughes and the other courageous Lycoming Countians who participated in helping with the Underground Railroad is detailed in an excellent documentary film. “Follow the North Star to Freedom,” made by area documentary maker Karen Frock. Interestingly enough, one of the primary persons assisting Frock in the film was Mamie Sweeting Diggs, the great-granddaughter of Daniel Hughes. She has spoken far and wide preserving the courageous legacy and story of her special great-grandfather.